The Cypriot national broadcaster , CyBC is going on with its teasers aiming to introduce progressively the country’s entry to the audience. After revealing Alex Papaconstantinou and the his creative team that will be the behind the cypriot entry the national broadcaster posted a new quiz this time referring to the staging director of its Eurovision 2019 entry. The next quiz askes about the relation between Swedish act Darin and the Cypriot Eurovision entry. Apparently the answer has to do with the well known choreographer Sacha Jean Baptise, as Darin ‘s work was a sample of Sacha’s contribution, who will be responsible for the Cypriot entry’s staging for a 4th time. 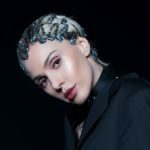 Sacha is familiar to Eurovision family as she has been involved many times in several country’s staging.At the 2018 contest she directed the performances of Cyprus, Australia and Bulgaria, she has also previously worked with the delegations of Armenia (2016) and Georgia. Apart from Eurovisiom Jean-Baptiste has great experience as a choreographer contributing in the staging of many TV shows as the Swedish Idol, X Factor Sweden of course Melodifestivalen.